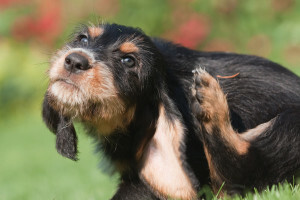 Chronic scratching in dogs is a common, and sometimes frustrating condition, that we often have to deal with. The most common cause is an allergy known as Atopic Dermatitis. Previously, we have resorted to steroids to treat itchy dogs, and in some cases we will continue to do so. But now there is an alternative. Apoquel is a new drug recently released in Australia for the treatment of pruritis (itch) associated with allergic dermatitis in dogs. It has been available in the US for a couple of years, and was so successful that the Australian launch was delayed due to supply issues. Apoquel acts differently to cortisone (steroids) and other immune suppressant drugs, and as such, has far fewer side effects like liver changes, eating and drinking too much, weight gain and panting. We are really pleased that we now have an alternative treatment for itchy dogs, especially for those dogs that do not tolerate cortisone well. As with all prescription medications, a full check up consultation is required before medication can be given. This gives us the best chance of a reaching diagnosis for your pet, and will help us to give you pet a happy and more comfortable life. For more information talk to one of our Vets today.